#EastVanLove invites you to The Love Umbrella Project! Valentine's Day is a day where people come together to celebrate love. It's also a day to show appreciation to those who have touched our lives and communities in so many ways. A great way to celebrate this day is at the Love Umbrella Project Celebration Party. There will be drinks, great people, and an exhibition of all the wonderful photos (including one we created on your behalf). The proceeds go to Leave Out Violence – a non-profit anti-violence organization that empowers young people to tell their stories through multimedia arts projects. #EASTVANLOVE: Where do you see the love in Vancouver? Sufis say the moon is like a mirror to our soul and a reflection of who we are — that night she overpowered the clouds and showed her unbelievable radiance and beauty. It seems she was simply reflecting the wonderful energy that was shown on the beach — I’m ever so grateful to all of you who came and participated in the social experiment that night. You are all amazing souls that have illuminated my life and the city around us. And special thanks goes to Tracey and Madeline for capturing the essence of our message and the moment! Click here to read Ajay's story: Vancouver is like a good masala – a blend of spices that comes together perfectly to tantalize the senses from all directions. What need does your community fulfill? #EastVanLove (www.eastofmain.com) – is a network and our mission is to pride our neighbourhood and the people who live, study or work within it. With the gentrification that is happening in the area, it’s important we honor the past but embrace a future that includes all members of the communities. Thus our mandate is to promote non-profit organizations and businesses that have their values embedded in social justice and environmental sustainability. We live our mission through our online means (hosting a website and leveraging social tools such as Twitter, Facebook, Flickr and YouTube) and hosting Tweetups (in-person events bringing together those who tweet and do not tweet) that celebrates our local champions. CoopCulture (www.coopculture.com) – is a social experiment to bring a nuanced dialogue to address the two questions “what does multiculturalism in our communities really mean and how do we envision a more inclusive, stronger society?” We have hosted dialogues and use our website to facilitate dialogue on this topic. We do not have answers but pose provocative questions for the community to answer in order to empower everyone to transform. 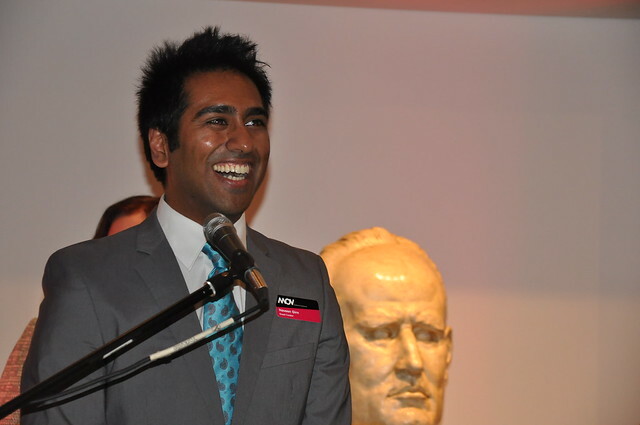 BC Patient Safety & Quality Council (www.bcpsqc.ca) - is where Ajay currently works full-time. They are an arms length entity from the Ministry of Health and their mandate is to improve the quality of care British Columbians receive in the health care system. Our hope is to support the system in this journey of improvement and ensure everyone receives the best care, no matter where. Huge gratitude to our supporters and partners – there are many organizations and individuals we are indebted to for their generous support. For the purposes of the #LoveUP project, we had partner representation from individuals who are involved in various movement-based groups that are involved in one or more the following: tackling systemic issues, having social events, strengthening our hearts, and heighten our spiritual awareness. What’s important about your community? What is important is staying true to our core values. Our work is rooted in caring for the planet and each other. We believe that the work we do must be fun, positive, and inclusive. And our process is to be organic. We try to have fun while planning our initiatives and ensure everyone that participates has fun as well. In our meetings we try to have them around food either as potlucks at someone’s house or at restaurants that take pride in the food they make. At our events even though they touch on serious issues in our society we try to frame them in a way to ensure they are engaging, two-way and in light-hearted ways so all can participate and no one feels left out. Added to this we know there are problems in our world and its always easy to criticize and point out what’s wrong. However, we feel that keeping things positive provides hope to people and that there are possibilities outside the current system that we must go to. We attempt members to dream what our society could like and help support them to plan to get there. We also seek to be inclusive. Equity, diversity and ensuring everyone has a fair chance to participate and grow is paramount to the work we do. We try to our best to ensure our work goes to the inter – that is, intercultural, intergenerational, and interdisciplinary. This is because we feel that that is where the answer of true love can be found. Incorporating multiple views from various perspectives makes this work very challenging, but when done right the outcomes are truly rewarding. As an example when we (Coop Culture) organized a dialogue to showcase how online tools are helping ethno-culturally diverse communities connect within and between communities we were thrilled to have a sold out event and a great discussion. However, what truly impressed us was something we didn’t plan for or expect. A twelve year old female attendee who attended the event approached one of the speakers after the event and told him that she was inspired with the work he was doing to educate non-Filipinos to learn Tagalog that she herself would like to do this when she grows up as to not lose connection to her heritage. The speaker asked the young girl how she came to the event and to his surprise she answered by herself as it was posted on Facebook and it sounded more interesting than what she would normally be doing on a weekday evening. Other examples – At Eastvanlove and RangiChangi Roots we do not ask for a set entrance charge but ask for donations, either financially or in volunteering, and ensure our events are open to all. We partner with organizations that have the same value set. And at Bee Vancity we tend to find events that are low barrier and promote those. To have initiatives that are challenging problems of our time and thought-provoking we try to keep our process is organic. We constantly evolve our work and processes by learning what went well and what didn’t go well. As Mother Nature teaches us we need to be agile and adaptable otherwise we won’t thrive and reach our fullest potential. As an example for each Tweetup we host at EastVanLove, we have evolved the format based on each of the themes we have wanted to have. Sometimes we have more champions speaking, and sometimes less. Sometimes we have panel discussions afterwards and sometimes we have music. But keeping true to our values we ensure our events are engaging and participatory. At our last Tweetup that we held in December 2012 at the East of Main Café we had three speakers share stories of why they were passionate about their work (including Maureen who spoke to Project Limelight). After the speakers told their inspiring stories we asked attendees that if they were inspired instead of just giving money to these organizations they could give the their hearts – literally. That is, those that were interested we asked them to write what skills they wanted to offer on a heart-shaped paper. The response was overwhelming as most of the attendees shared their heart. Our core values of being fun, positive and inclusive can be summed in what the South Asian cultures use in their cooking of curries, masala. Creating fresh masala is most definitely an art. One needs to bring together various spices (from very subtle flavours to very strong) to produce something that tantalizes the senses in multiple ways more so than just having a single spice in a dish. In the same way through these interconnected networks and communities we seek to liven and spice up Vancouver in hopes to spread love and happiness. As masalas are a combination of various spices there are an indefinite number of variations one can create. What masala do you think Vancouver needs? Experiment. Evolve. Share. Let’s spice up our city! EastVanLove 7: Meet our Speakers! Brock Tully is co-founder of Kindness Foundation of Canada which has on-line programs that show ways we can be kinder at school, at work, and at home. He is the Founder/Creative Director of the World Kindness Concert. He is a co-founder of Kindness Rocks in Schools - this program brings awareness to bullying and abuse and empowers people to help prevent it from happening. He is also Founder/Producer of One of a KIND Stories. “Kindness” is Brock’s passion and his purpose. He touches lives, instilling joy and planting seeds that will help you to develop your own ability to give. With his contagious energy, he stimulates audiences to act with compassion in your own communities, schools and workplaces. He weaves magic with reflection, bringing love into audiences’ hearts by shifting moods and perspectives. Helen Beynon has been the Community Development Coordinator at Evergreen BC since the spring of 2011 – in that time, she has learned more than she ever imagined possible about composting, garlic growing, and English ivy removal. Her job rewards her with new surprises every day, and she especially loves seeing kids expressions when they get to harvest their first zucchinis. Before coming to Evergreen, Helen worked on various sustainability and community development projects in South America and the South Pacific. When not playing in the dirt professionally, Helen can be found climbing rocks in Squamish. Sisters Maureen Webb and Donalda Weaver founded Project Limelight Society to give back to the East Vancouver community where they were raised. In July 2012, they launched East of Main Cafe which supports Project Limelight, both financially and through a food security program, providing healthy meals and snacks to their young participants. Project Limelight Society is a free performing arts program for children in Vancouver’s DTES and surrounding areas. East of Main Cafe is a social enterprise, and 100% of its profits go towards supporting Project Limelight Society. Project Limelight operates out of their new location, above East of Main, and at Strathcona Community Centre, a few blocks away. Top-Bottom, Left-Right: Jeremy Lim, Ariella Fong, Jorge Amigo, Juliane Siu, Mike Despotovic, Anita Oh, Derek Weiss, Evi Vassious, Kimie Ong, Ajay Puri (Photo by Sukhraj Battal) Thank you all for joining us at EastVanLove Vol. 6.5! We've got photos and other goodies to relive that energetic evening or to share with you in case you missed the event. MISSED THE EVENT OR WANT TO RELIVE THE ENERGY? We hope you all had a chance to mix and mingle with the new EastVanLove team and other compatriots who live in or just simply love, the neighbourhood of East Vancouver. SNAPSHOTS! We had two very talented photographers Sukhraj Battal (@SukhrajB) and Akshay Kanwar (@axepsy) document the entire evening. View the photos on our brand new Facebook page - feel free to tag yourself in the photos and share them with your friends! … and to our Sponsors! BeeVancity, Ethical Deal, This is Vancity, Yelp, and Toby’s Pub & Grill (kudos to Ben the bar manager and Terri the manager!). A big thanks to the young Button Brothers (can you believe these brothers are only 6 and 10?) and Mitmunk Design for donating their button making machine. A shout out to our lovely volunteer Evi for helping everyone make their very own EastVanLove keepsake buttons! We want to ‘Give Back’ at our next tweetup happening in early December.The holidays are just around the corner so we thought it would be great to give back to our fellow neighbours and Vancouverites. Things like doing a soup kitchen, giving out fresh fruits, or doing some other sort of volunteering -- we’re open to ideas! 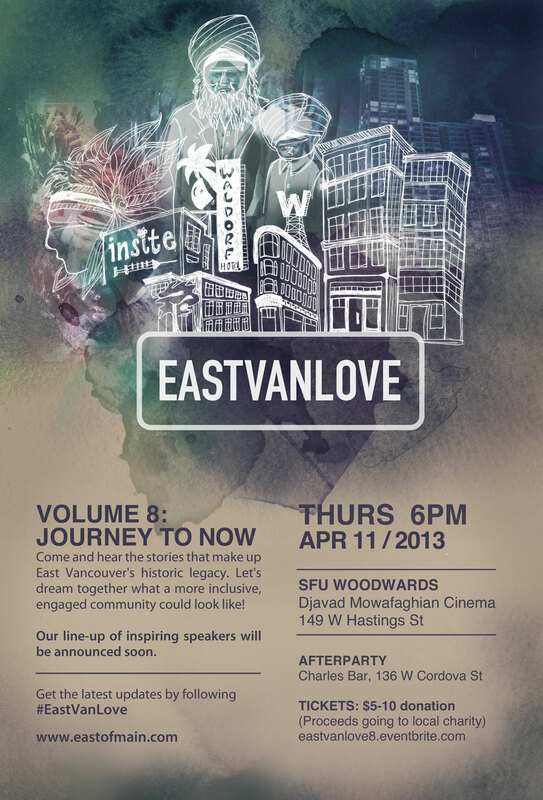 Tweet us @EastVanLove your ideas with the hashtag #EVL7 or email us. EastVanLove 6.5 Cover It Live! A RECAP OF @EASTVANLOVE VOL. 6: SOCIAL INNOVATION AND CALL FOR SPEAKER IDEAS FOR VOL. 7! How time flies! We want to thank you all again for joining us at EastVanLove Vol. 6. We've got photos, videos and other goodies to relive that awesome evening!Social innovators rise above every hurdle and boundary to reach their goal of making the local and global community a better place. We hope that this Social Innovation Tweetup has inspired you to think of ways you can be more actively involved in our community. In this post: 1. A Recap of EastVanLove Vol. 6 "Social Innovation" 2. Unveiling of our NEW EastVanLove logo. What did you choose for us? 3. Calling for speakers for EastVanLove Vol. 7! Read on to find out what the next theme will be! We’ve collaborated with freelance videographer, Lena Franford (@LenaFranford), for this volume of EastVanLove and she did an amazing job recording the event! She truly captured the EastVanLove energy! SNAPSHOTS! The very talented Sukhraj Battal (@SukhrajB) documented the entire evening which you can view in our Flickr pool. Feel free to tag yourself in the photos and share them with your friends! A FEW WORDS... Ariella Fong (@AriellaFong) from Vancouver Observer wrote a few remarkable articles covering EastVanLove Vol. 6 and on the presenters. Have a read on your lunch break or frankly, any time at all! OTHER WAYS WE COVERED THE EVENT: COVER IT LIVE -- Interested in all the tweets from the event and not just the best? Here are all your tweetsfrom this great night! SLIDESHARE -- Wanted to review the presentations? Check them out on Slideshare! A very gracious THANK YOU to our host Calabash Bistro (@CalabashBistro). And now, presenting our new EASTVANLOVE LOGO! You voted, we listened, so here it is! Check out the contest that occurred here. Any thoughts or ideas on our new look? Let us know! CALL FOR IDEAS: EastVanLove vol. 7 We’re excited to announce that we're aiming for the next EastVanLove Tweetup to be held at the end of September in conjunction with Social Media Week! The theme, as voted by you, will be "the History of East Vancouver" We want your speaker ideas! Have a local hero doing amazing work in East Van? Do you know someone with a rich knowledge of our past? Are you itching to share your stories and experiences of East Van and its history? Tweet us @EastVanLove or email us! Stay updated even when you're not there! What do reusable menstrual pads, dealing with e-waste, the resurgence of the DIY movement, and smoking dope have to do with East Van? Come and hear these stories at the next volume of #Eastvanlove! East of Main is proud to present EastVanLove Tweetup Vol. 6 Social Innovation next Tuesday, May 29. Thank you all for helping us sell out -- we couldn't believe the tremendous response! Within 25 hours, all tickets were gone! Speakers Want to know more about our presenters? Read up on them here! Admission is for ticket holders only. At the door we'd love a donation! We are a volunteer-based group and so any amount would be greatly appreciated to keep #EastVanLove going! Come early to save a seat! Vancouver’s East side is a hotspot for creative innovation and entrepreneurship. Bright minds and rich ideas shine far and wide over the bustling cityscape we call our home. 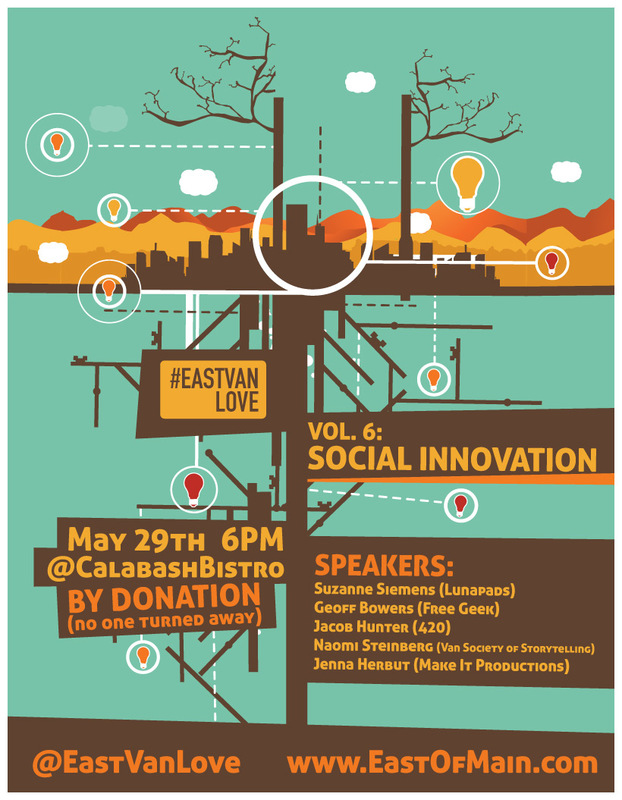 On May 29th, 2012, join us at Calabash Bistro (428 Carrall Street) for the sixth volume of EastVanLove: Social Innovation. Social Innovation can be defined as new concepts and organizations that meet social needs to extend and strengthen society. By harnessing creative solutions in response to social problems, Vancouver’s social innovators rise above every hurdle and boundary to reach their goal of making the local and global community a better place. Join EastVanLove as we celebrate the great ideas that have made a beneficial impact on this city and the world. A big, big THANK YOU to our sponsors! Madeleine Shaw and Suzanne Siemens are the co-founders of Lunapads, an East Vancouver based company offering sustainable alternatives to disposable feminine hygiene products. Used by women in over 40 countries worldwide, the use of Lunapads has diverted over 1 million pads and tampons from landfills every month. Madeleine and Suzanne have been acknowledged with several awards, such as BC Business magazine's Top 20 most innovative companies and recently the Global Women's Summit Leadership Award, for their social innovation and entrepreneurial excellence. Much of Geoff's background revolves around education, from camp counseling to ESL. He taught high school social studies and computers public in the North West Territories for 4 years. Once he paid off his student loans, he returned to Vancouver looking for a job invoking computers and education. Geoff Bowers found Free Geek by chance on Craigslist in the summer of 2009. Free Geek takes all working and non-working computer equipment where its volunteers share tech knowledge plus the reusable hardware furnishes computers for non-profit organizations. Despite going through organizational growing pains, Free Geek gives Geoff his tech and education fix and he strongly feels it's a great fit for him. 420: Jacob Hunter (@JacobHunter) Jacob Hunter is a political consultant and advocate for drug policy reform, social justice and environmental sustainability based in Vancouver, British Columbia. He is the founder and administrator of the drug policy activist website WhyProhibition.ca and is the Managing Organizer of the Vancouver 420 rally, as well as the Vancouver Cannabis Day rally. Jacob has also provided extensive communications support for medical marijuana dispensaries across Canada. 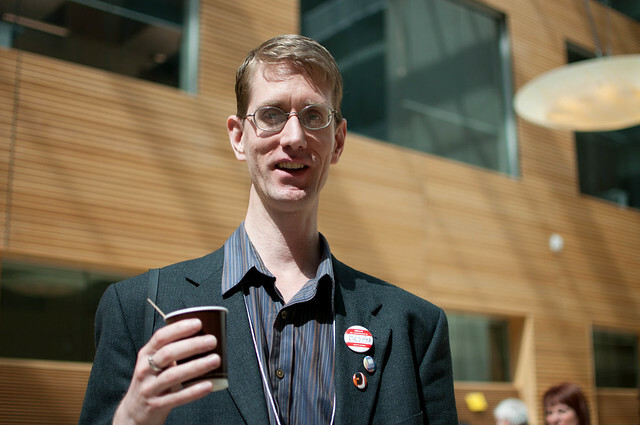 He also serves as the Vice-Chair of the City of Vancouver Active Transportation Advisory Council, and sits on the Board of Directors of the BC Civil Liberties Association (BCCLA), and the Pivot Foundation. For Naomi Steinberg, connecting with four year olds is as marvelous and unique an experience as connecting with 84 year olds - both are possible through storytelling. The past 13 years of her life have been closely focused on community engagement and performance and in her own words “to be a storyteller, first you have to be a story-listener”. In her current role as Artistic Director of the upcoming "what stories are made of" Storytelling Festival (June 8-10), Naomi intends to foster an appreciation of the art in all of its aspects and applications, for audiences of allsorts! It all started with a Booty Belt. Jenna Herbut started selling these belts right after her graduation at the University of Alberta, in over 120 boutiques across Canada, USA and Japan. The thrill of growing her business allowed Jenna to experience a lot of things such as becoming a pro at PR and getting her Booty Beltz in numerious magazines. Eventually, Jenna transitioned from selling her belts wholesale to directly to customers at crafts shows. Eager to change the stereotype of boring craft shows, Jenna made it her mission to make her own fun DIY show. Jenna also launched Make It University for those who want to bump up their business skills and be successful in doing what they love. 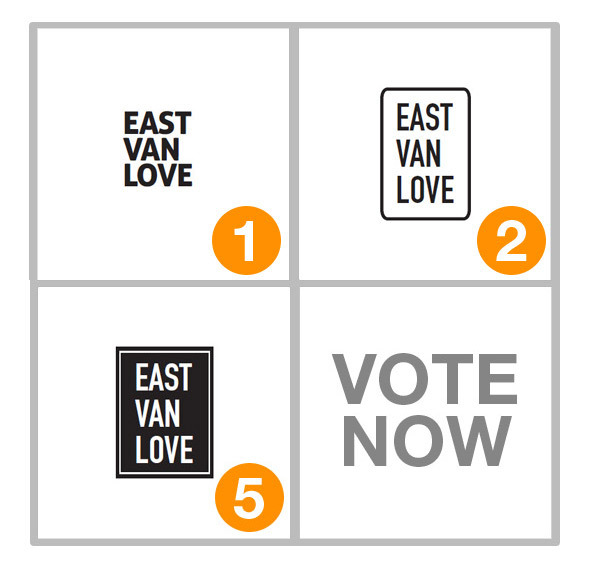 Vote for your favorite EastVanLove logo! What's a tweetup and why do people attend them? Tweetups are becoming a popular way to meet others. Find out what goes on in a tweetup from the perspective of Natasha D'Souza as she attends her first EastVanLove tweetup.